Knight Carl visits the Jesuit House of 1730 in Cebu, Philippines, a Spanish colonial house that has seen nearly 300 years of history. Dan at Archaeolog reasons why archaeologists should embrace the image of Indiana Jones, rather than be embarrased by it in Archaeology, Science Fiction and Pop Culture. For those of you in Facebook, lend your support to the cause, Save the Majapahit Trowulan Site!, a site which has been damaged in large part due to the sheer incompetence of the government. 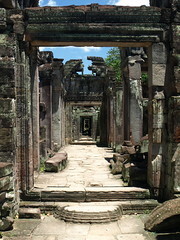 If you can’t go to Angkor, then perhaps Le Grand Tour d’Angkor can bring the stunning temples to your desktop. This website gives you a preview of the virtual tours you can take through the CD. Pick up a CD for yourself and visit 120 sites from the Angkor Archaeological Park and beyond.